The location and depth of the recess for the three plastic spring clips on the CrushGrind shaft and wood mechanisms is one of the key cuts to successfully fit the mechanisms correctly. The recess cutting tool helps you achieve this. 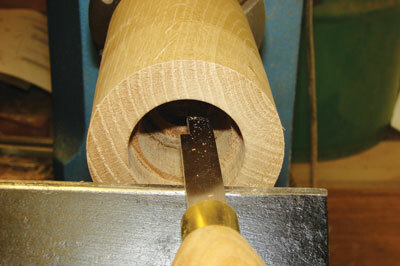 The tool blade is shaped in such a way that the groove position can be cut accurately if the shoulder is lined up with the end of the cut-out portion of the tool blade. Additionally the 'V' notch gave me the correct positioning for cutting the groove in the drive portion of the mechanism on both the shaft and wood mechanisms. I found that the length of the tool blade was correct, thus allowing me to feel that I was in control. This resulted in a clean and accurate cut. The instructions supplied were clear and informative, which gave me further confidence in using the tool for the first time. Sharpening the tool can be easily achieved with a diamond file - which will save removing an excessive amount of steel - and will keep the key cutting dimensions accurate. For anyone turning salt and pepper mills using a CrushGrind mechanism, this tool will be a welcome addition to the necessary tools required. The price of around £22.50 is very reasonable and would be money well spent. Repeatable and accurate cutting of the locking recess for CrushGrind mechanisms is a must. Failure to have this sorted will result in faulty fitting and possible problems in removing them later on. This is a well made tool from Robert Sorby and addresses a specific issue with CrushGrind tools. I would take off the sharp edges underneath with a diamond file for easier movement across the rest, and would suggest only honing the cutting tip to maintain a sharp edge. 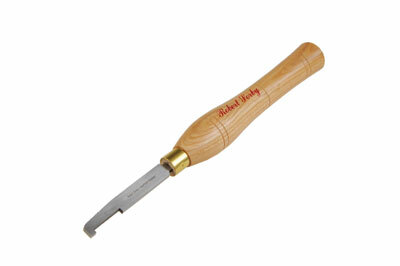 The tool works superbly and does what it is supposed to do well.